When Gap told the world to "be true to your hue," it probably didn't have Indonesia's waterways in mind. Yet the retail giant, which also owns the Banana Republic, Old Navy, Piperlime, and Athleta labels, is among a raft of brands that have turned the Citarum River in West Java into an unnaturally florid chemical cocktail, according to a new Greenpeace report. Published Wednesday, Toxic Threads: Polluting Paradise details how the company's business relations with P.T. Gistex, which runs the polluting facility, has transformed a once-pristine watershed into a sewer of toxic, hormone-disrupting, and highly persistent substances. Greenpeace, which sampled the P.T. Gistex factory’s discharge outfalls, identified a diverse range of hazardous chemicals, including nonylphenol and tributyl phosphate. The environmental nonprofit, which sampled three of the P.T. Gistex factory’s discharge outfalls in May 2012, identified a diverse range of hazardous chemicals, including nonylphenol, tributyl phosphate, and high levels of dissolved antimony, a poisonous metalloid used to manufacture polyester. Wastewater discharge from two smaller intermittent outfalls was also extremely alkaline, indicating that the effluent hadn’t received even the most basic of treatment. 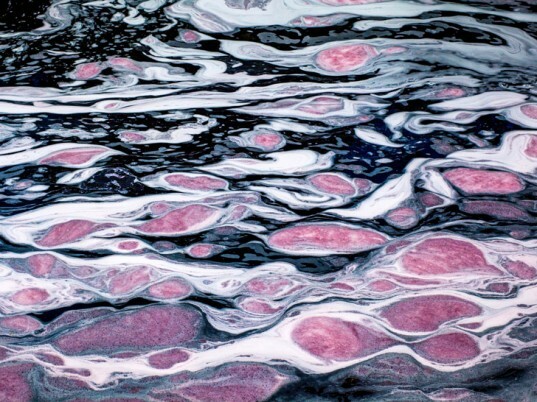 Wastewater with a pH value of 14, the report notes, is very caustic, will burn human skin coming into direct contact with the stream, and will have a severe—and most likely fatal—impact on aquatic life in the vicinity of the area of discharge. “People living along this river, that rely upon its water, have a right to know what is being released into it, and the customers of the international brands like Gap have a right to know what chemicals are being used to make their clothes,” Birry adds. Other companies linked to P.T. Gistex include Adidas, Brook Brothers, and H&M, investigations revealed. 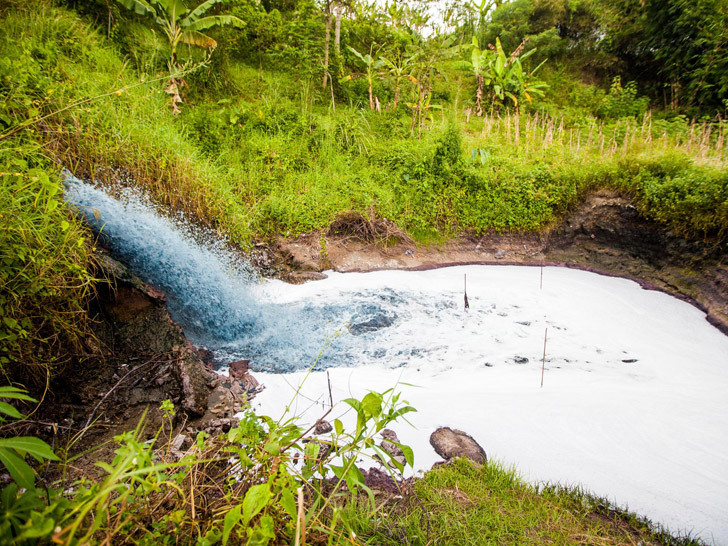 The textile industry is currently one of the biggest contributors to industrial toxic water pollution in West Java, says Greenpeace, with 68 percent of industrial facilities on the Upper Citarum dedicated to producing textiles. “Gap’s latest advertising campaign declares that we should ‘Be Bright,’ but by collaborating with toxic suppliers Gap’s clothes are turning the Citarum into a multicoloured mess," says Ashov Birry, a toxic-free water campaigner for Greenpeace Southeast Asia, in a statement. "Gap and other big brands need to work with their suppliers in Indonesia and elsewhere to urgently eliminate all uses of hazardous chemicals from their supply chains and products before it is too late." The environmental nonprofit, which sampled three of the P.T. Gistex factory's discharge outfalls in May 2012, identified a diverse range of hazardous chemicals, including nonylphenol, tributyl phosphate, and high levels of dissolved antimony, a poisonous metalloid used to manufacture polyester. Wastewater discharge from two smaller intermittent outfalls was also extremely alkaline, indicating that the effluent hadn't received even the most basic of treatment. Wastewater with a pH value of 14 is very caustic, will burn human skin coming into direct contact with the stream, and will have a severe—and most likely fatal—impact on aquatic life in the vicinity of the area of discharge, the report notes.